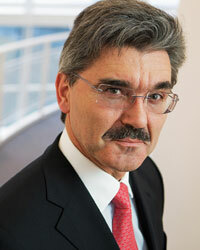 Siemens CFO Joe Kaeser argues that multinationals must work to restore confidence in the economy. Siemens says it’s “addressing the world’s toughest questions” in its corporate brochure, an assertion that is certainly borne out by the views of Joe Kaeser, its CFO since 2006, who joined the company in 1980. As finance chiefs focus on gauging the impact of the European debt crisis on their own businesses, Kaeser believes multinational corporations have an even more fundamental role to play in restoring confidence in the economy. “Our biggest task right now is that we go out to the public and our customer base and work with them on how we can help them finance their projects—and how we can help them to gather more confidence again to invest into the opportunities of the global market,” says Kaeser, who was previously chief strategy officer.